Huangshan Mountains stands towering in the south of Anhui province near to She, Yi, Taiping and Xiuning four counties. It occupies an area of 250 sq km, of which 154 sq km is the core of the scenery. Huangshan Mountains was originally named Yi Mountain where it was said that Xueyuan emperor was always cultivating his morality and developing pills of immortality here. Not only is Huangshan Mountains famous for its beauty and elegance, but also it is a scenic spot of national level with its high value in science and ecological environment. It has rich natural resources and a comprehensive ecology which has been collected into "the Directory of World Cultural and Natural Heritage". As early as millions of years ago when the Earth's crust was in an overactive state, Huangshan Mountains had been erecting high above the sea level. The mountains had finally grown into a vigorous scene through the tempering of the century of the 4th Glacier. There is quite a scene inside the 154sq km acreage of Huangshan Mountains. The development of this breathtaking state is made up of many coarse types of granite, which often primarily grows into up-straight state. Since the force of erosion, the rock gradually is changing into huge post-like shape, thus helps the come-into-being of the imposing queer peaks and valleys. 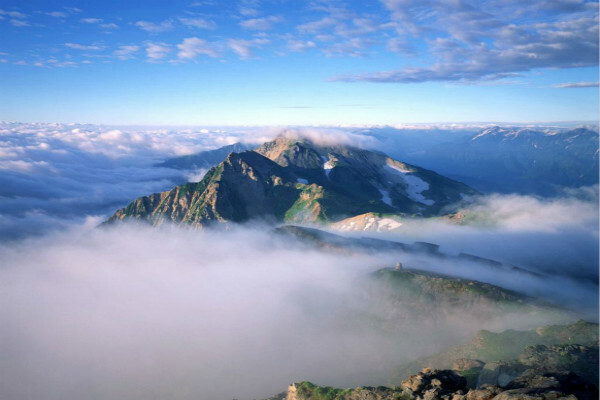 The main peak is called Lotus Peak, 1,864 meters in height; it is in hand-in-hand state with the flat Guang Mingding, and the precipitous Tuandu Peak. The Lotus is standing at the center of the scene, with other 77 high peaks, all of which are more than one thousand meters high, scattering nearby. Many exquisite rocks are distributed among these steepy peaks, of which, 120 are formally named. Their shape resemble with rare birds and animals, figures in fairy tales. The mountains area is primarily covered with Huangshan pine trees, where they stubbornly break the rock and emerge off the soil. You can find them even in the most dangerous place, such as the cliff and the deep valley, posing their muscularity frankly. 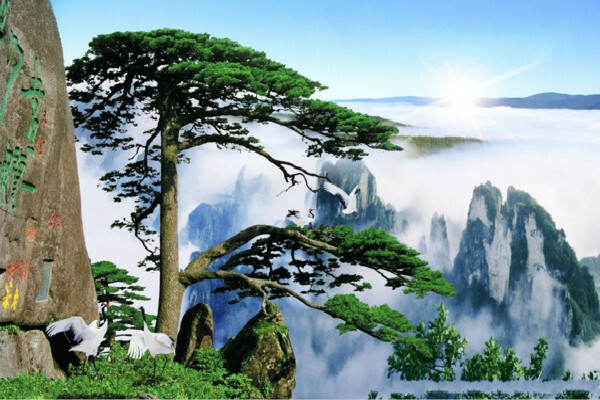 Huangshan pine trees is in a dominant position in this area, there are around 30 kinds of them have received general recognition, such as Yingke Pine, Wolong Pine, Tanhai Pine, Black Tiger Pine, etc. People are astonished at their perseverance and vitality, which helps them survive the cold wind, heavy rains, snows, and other elements. 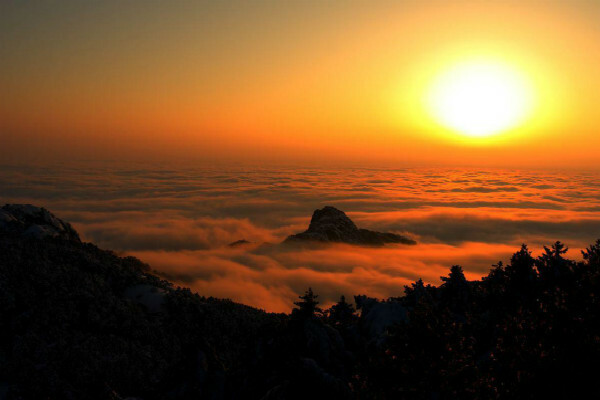 Huangshan Cloud shuttles back and forth among the countless peaks, their vastness and generosity can be ranked abreast with the sea; they present a beautiful scene with the dawn fog and the setting sun. Huangshan Hot Spring, which had ever been called "Ling Spring", "Tang Spring", or "Vermilion Spring", is celebrated for its fresh, clean and cool nature. The spring is a wonder of Huangshan and has various purposes, such as drinking, bathing and etc. The Huangshan Mountains are the watershed of the two main rivers, Yangtze River and Qiantang River. The special geographic position has cultivated the development of 36 big canyons, and the source of 36 branches. Therefore, Huangshan is also famous for its waterfalls, and some famous ones are "Renzi Fall", "Baizhang Fall", and "Nine Dragons Fall". As the vertical cleavage of the rocks is very finely developed, there have formed many magnificent and beautiful caves and tunnels, which add another crucial credit to the beauty of Huangshan. On the walls of these caves and tunnels, people found more than 200 valuable sculptures, writing and paintings, which inscribe the history and culture of ancient times. Huangshan Mountains virtually presents a long three-dimensional picture scroll, with the rising and setting sun, the cloud and the fog, the pine trees and the religious smell, the beauty of the Autumn and glaciers, the valleys and the singing birds, the perfume of the flower and its culture. Huangshan is the integration of natural beauty. It is here that wherever you go, you will find yourself surrounded by strange, beautiful, dangerous scene; At each corner is an outstanding masterpiece of God, an earthly paradise, at which you couldn't help yourself sighing with feelings at the majestic power of nature. Huangshan Mountains is one of the most precious heritages of human kind, and one of the most famous scenic spot in the world. Huangshan Mountains has opens her generous arms to the guests from allover the world.